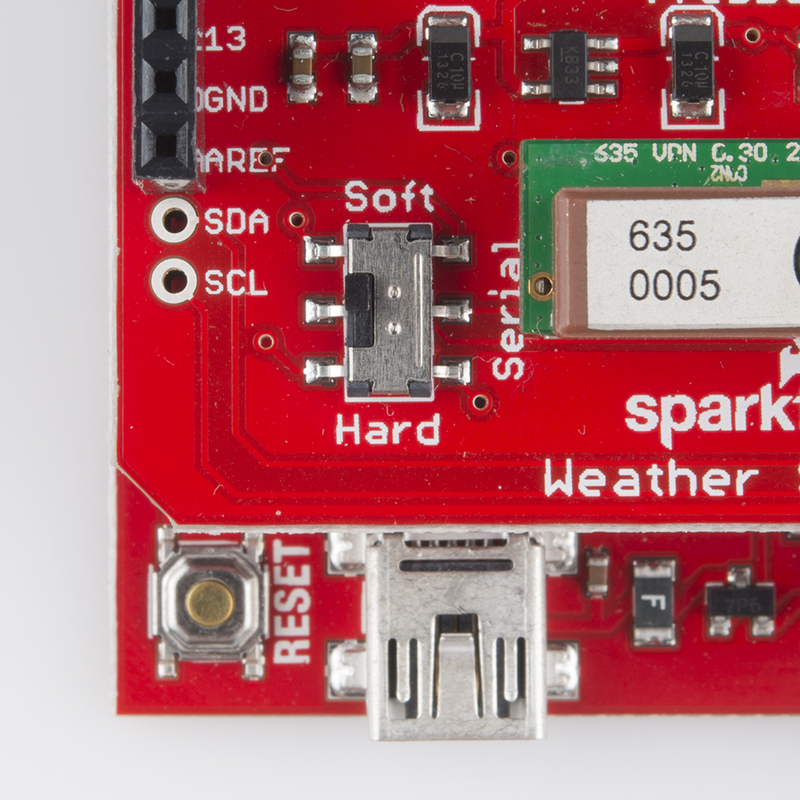 The Weather Shield is an easy to use Arduino shield that grants you access to barometric pressure, relative humidity, luminosity, and temperature. There are also connections to optional sensors such as wind speed/direction, rain gauge, and GPS for location and super accurate timing. Uses the HTU21D humidity sensor, MPL3115A2 barometric pressure sensor, and ALS-PT19 light sensor. 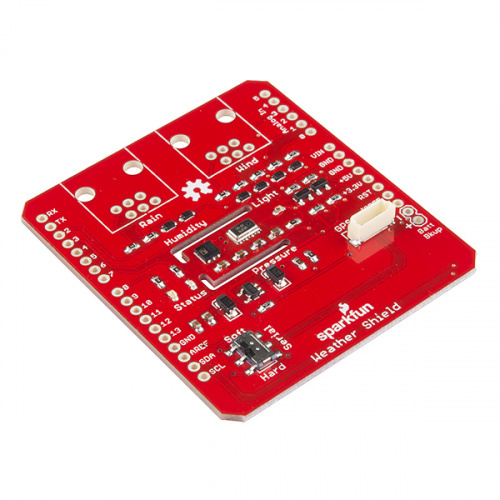 Solder the stackable headers onto the shield, and insert the shield into your Arduino. You are welcome to solder in the RJ11 connectors to the top of the board as well. If you have the GP-635T GPS module, don't worry about attaching it at this time, we'll get to GPS later. This example prints the current humidity, air pressure, temperature and light levels. Put your hand over the small clear device labeled 'Light' and watch the light level change to 0. Blow lightly on the humidity sensor and watch the humidity change. 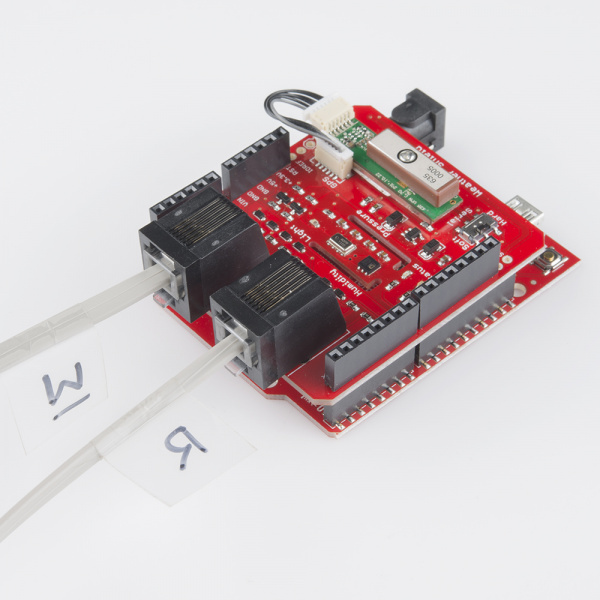 I2C communication to sensors is not working. Check solder connections. This message appears when the board is unable to get a response from the I2C sensors. This could be because of a faulty solder connection, or if there are other devices on the A5/A4 lines (which are also called SDA/SCL). For the more adventurous, we have the Weather Station example. This code demonstrates all the bells and whistles of the shield. You will need a weather station hooked up to see the wind speed, wind direction and rain values change. example if you're just getting started. The $ and # are start and stop characters. These types of bytes are used to make it easy to parse out the data. For example, you could have an Electric Imp listen for a $ and record the data until you see a #. Once you have the string then split on the commas (also known as comma delimited), and start recording the next string. Attach the GP-635T GPS module using the short cable. To secure the module, there is space on the shield to attach the module using double-stick tape. Serial pins are connected to digital pins 4 and 5 when Serial is set to soft and are attached to the internal UART when set to hard. There is a switch labeled Serial on the shield. 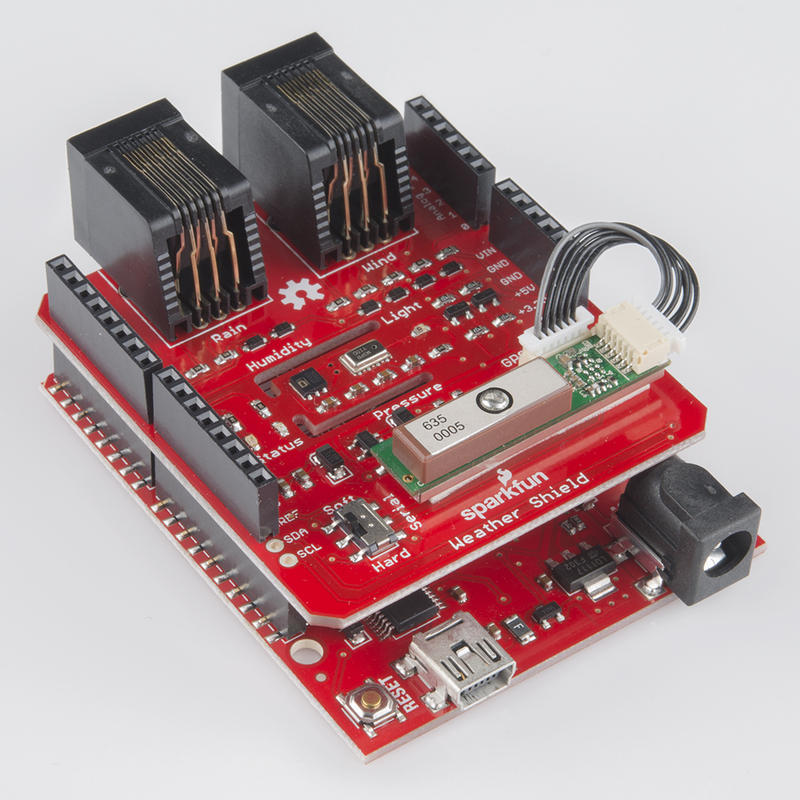 This is to select which pins on the Arduino to connect the GPS to. In almost all cases the switch should be set to 'Soft'. This will attach the GPS serial pins to digital pins 5 (TX from the GPS) and 4 (RX into the GPS). Note: The batt_lvl is indicating 4.08V. This is correct and is the actual voltage read from the Arduino powered over USB. The GPS module will add 50-80mA to the overall power consumption. If you are using a long or thin USB cable you may see significant voltage drop similar to this example. There is absolutely no harm in this! The Weather Shield runs at 3.3V and the Arduino will continue to run just fine down to about 3V. The reading is very helpful for monitoring your power source (USB, battery, solar, etc). This example demonstrates how you can get location, altitude, and time from the GPS module. This would be helpful with weather stations that are moving such as balloon satellites, AVL, package tracking, and even static stations where you need to know precise altitude or timestamps. The Weather Shield example firmware outputs regular barometric pressure. This is very different from the pressure that weather stations report. For more information, see the definition of "altimeter setting pressure". For an example of how to calculate altimeter setting type barometric pressure see the MPL3115A2 hook-up guide. Also checkout the MPL3115A2 library, specifically the BarometricHgInch example.